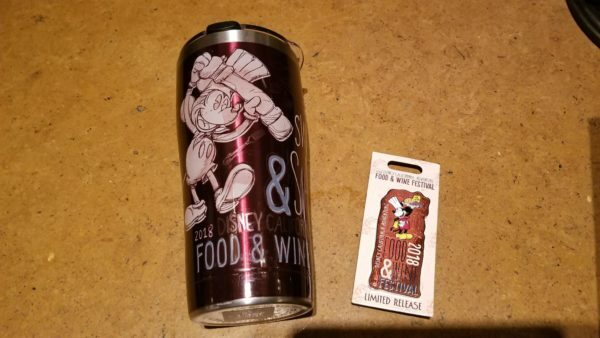 Our very own Chip is on the scene this week at the California Adventure Food & Wine Festival and has uncovered a delectable range of must-try treats. If you’ll be paying a visit to Disney California Adventure before the fest finishes on April 12th, be sure to stop by Cluck-A-Doodle-Moo and give one of our favorites, the Orange-Vanilla Cream Float a try. This tasty beverage is non-alcoholic and makes the perfect treat for Festival visitors of all ages. The taste is reminiscent of those delicious Dreamsicles you had as a child. Its that same delightful combination of orange and vanilla topped with a hefty dose of whipped cream with vanilla cake cubes as the crowning glory. One of these drinks will set you back $6.50 or you also have the option of ordering it in a Food & Wine souvenir container for $10.50. We definitely think this is a treat worth seeking out. Readers are encouraged to keep following along with Chip and Co. for the latest in California Adventure Food & Wine news and updates.